The 2017 Lynne Ramsey directed film “You Were Never Really Here” starring Joaquin Phoenix is coming to Blu-ray Disc on July 17th via Lionsgate. The film is “certified fresh” over at Rotten Tomatoes. The release will include a Digital Copy of the film. It’s now available to PRE-ORDER the Blu-ray over at Amazon. Tech specs for the Blu-ray release include full 1080p HD video in the 2.39:1 aspect ratio and DTS-HD 5.1 Master Audio sound. It would appear no bonus materials are set to be included on the release. Lastly, you can find the full announcement about this release further below (after the break). 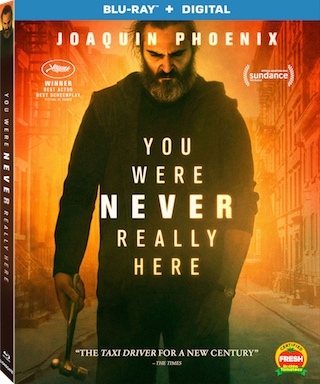 Golden Globe® winner Joaquin Phoenix (Best Actor – Motion Picture – Musical/Comedy, Walk the Line, 2006) is “haunting” (Chris Nashawaty, EW) in You Were Never Really Here, arriving on Digital July 3 and on Blu-ray™ (plus Digital), DVD, and On Demand July 17 from Lionsgate. Based on Jonathan Ames’s novella of the same name, and written for the screen and directed by award-winning director Lynne Ramsay (We Need to Talk About Kevin, Ratcatcher), this Rotten Tomatoes Certified Fresh™ gritty thriller won Best Actor and Best Screenplay at the 2018 Cannes Film Festival. Also starring Ekaterina Samsonov, Alessandro Nivola, and Judith Roberts, the You Were Never Really Here Blu-ray and DVD will be available for the suggested retail price of $24.99 and $19.98, respectively. Title Copyright: You Were Never Really Here © 2017 Why Not Productions, Channel Four Television Corporation, and The British Film Institute. All Rights Reserved. Artwork & Supplementary Materials © 2018 Lions Gate Entertainment Inc. All Rights Reserved.